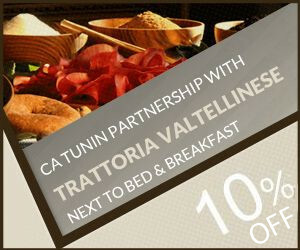 “Ca Tunin” is a new bed and breakfast located in the historic center of Tirano. A friendly and welcoming home, with all the comforts, for those who love the freedom of the bed and breakfast but with all the advantages of Hotel accomodation. Our Bed and Breakfast was completely renovated in 2014 and offers 3 large rooms suitable for couples and families. Each room includes air conditioning, a private bathroom and electronic key for maximum freedom of our guests. A very bright and spacious breakfast room, on the first floor, complete our offer.